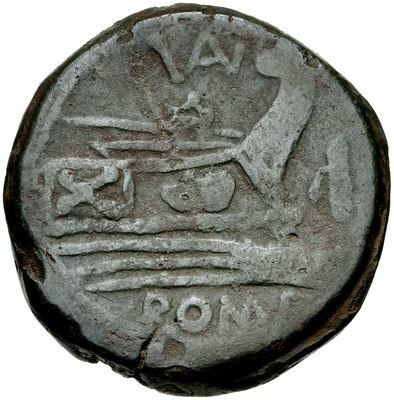 Valerius was one of the moneyers for the year 169-158 BC. He is unknown except for his Gens. Gens Gens Valeria was a patrician family at Rome, prominent from the very beginning of the Republic to the latest period of the Empire. Publius Valerius Poplicola was one of the consuls in 509 BC, the year that saw the overthrow of the Tarquins, and the members of his family were among the most celebrated statesmen and generals at the beginning of the Republic. Over the next ten centuries, few gentes produced as many distinguished men, and at every period the name of Valerius was constantly to be found in the lists of annual magistrates, and held in the highest honour.